The central claim in Christ Formed in You is that it is God’s purpose to change us by progressively making us more like Jesus, and that this happens only as we understand and apply the gospel to our lives. 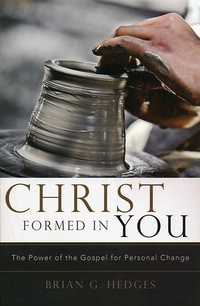 In this book we will explore the transforming power of the gospel from several angles. Part One focuses on the foundations for personal change. We will look at God’s ultimate goal in transforming us, the key to transformation, which is the gospel itself, and the application of the gospel to our lives in specific ways. Part Two then takes up the pattern of personal change. It explores the captivating beauty of gospel holiness with its demands that we both kill sin and grow in grace by the power of the Spirit, and the quest for joy that motivates us in this pursuit and strengthens us in the battle for holiness. Part Three focuses on the means of personal change, the tools God uses to transform us. These final three chapters, while building on the foundation of the gospel discussed earlier in the book, are the most practical. We will learn how God uses spiritual disciplines, suffering, and personal relationships in the body of Christ to conform us to the image of Christ.